The Pew Charitable Trusts' Safe Credit Cards Project yesterday published a revealing report into the business of business credit cards. Many of these credit cards are great for corporations and small businesses, but applying for one as a consumer can be a costly mistake. When Congress passed the Credit CARD Act of 2009, it excluded credit cards aimed at businesses, which generally have "corporate," "business" or "professional" in their names. That was a perfectly reasonable move, and follows a precedent set by legislators back in the 1970s. The reasoning behind the legislation? Two companies (one the card issuer, the other the business client) have a more equal bargaining position than a bank and a consumer. After all, consumers generally lack the legal advice and business savvy of a business client. "Every month more than 10 million business credit card offers are mailed to households at all income levels. The sheer number of offers that are sent to homes all across the nation represents a risk to millions of American families." In other words, huge numbers of consumers are constantly being tempted to sign up for products that are completely beyond the reach of existing credit card regulations. 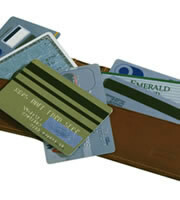 Credit card offers for business products ARE tempting. According to IndexCreditCards' credit card rates monitor, the average annual percentage rate (APR) today for a business rewards card is 16.21 percent. The same figure for consumer rewards cards is 17.48 percent. And credit card rewards programs on many business cards can be exceptionally generous. "(Seeley) told the Bee that her issuers had shortened the time she has to get in a payment after receipt of her statement from 25 days to 14 days. And they have increased her late fees from $29 to $50. Neither of those moves would be legal for consumer cards under the Credit CARD Act of 2009." However, the blog went on to say that consumers who don't need protection (those who are never late paying no matter how often a card issuer juggles with dates, who never go over their credit limit and who can absorb any penalty rates without finding themselves in trouble) can benefit from holding a corporate card. It is those consumers who are less organized and less wealthy who still need to be protected from potentially predatory practices. Perhaps that's why Pew advocates extending the provisions of the CARD act to "any credit card product that requires an individual to be personally or jointly liable for account expenses," and forcing credit card companies to tell applicants if a product doesn't carry normal consumer protections. 0 Responses to "Business credit cards can be a bad idea for consumers"